Most reading this have either seen or are aware of the movie “Chariots of Fire”. 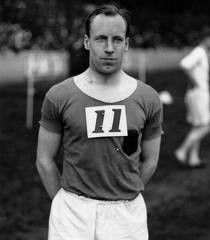 Eric LIddell was a serious follower of Jesus and in the end his love for God and others brought him to death in a foreign land as a missionary. Well, God did NOT make me fast, but the gifts (of the Spirit as well as practical talents, abilities) I’m certain He -has- given must be put to use in love. Not merely for personal gain, satisfaction, to impress others or whatever… but as a reflection of Him and His glory. “What have we been given that isn’t a gift?” says the New Testament. So we either give God glory and serve in that attitude or we grasp for self, for our own kingdom-building plans or some other sense of fulfillment. One issue is that instead of being a witness for Him we are reverse witnesses. Am I always kind, patient, loving? Do I always reflect my Savior to others as He would have me do? No, sadly, no. On the other extreme end, any of us can and likely at times do try to play the part of Lord or perhaps Savior for another person… and ain’t a one of us up to either gift, calling or task!! One of those rarely quoted verses of Jesus rings in my head: “The one who does not gather with Me scatters”. Which is it? How often do we blow a chance to love, to be kind, merciful, serving, giving? How very often do we fail at -being- “the hands and feet of Christ” on our block, at work, in the street? But oh how I sense God’s pleasure when I’ve been faithful to my calling, gifting and areas of service. I’m not talking about earning salvation, forgiveness, eternal life- we simply cannot DO that. Only the love and grace of God through Jesus accomplishes that! Yet in an active, loving service to Him, His people and those still without faith and obedience to Him, this is the core of the missionary call. Some would think Liddell an idiot to not make as much money and grasp as much glory and fame as possible from his amazing running ability, stick around Europe and bask in the limelight. Instead he died in relative obscurity on a mission field far from his native Scotland. And, I fully expect, felt God’s pleasure as some he influenced were drawn to Christ. So… I ask you what I often ask myself: who you glorifying? Gathering or scattering? Something worth thinking about as we journey through life. There is simple life and complex life. Much of life seems to move from the former to the latter. Regardless of your current age you will likely come to the conclusion that things were simpler, rather easy overall when you were younger. So how is it that things get so complex? In a phrase, by taking on more responsibility. The young don’t much consider (and often avoid) it because of the inconvenience of thinking about details one isn’t all that interested in. School, homework, yardwork, cleaning one’s room, laundry, washing the car, getting and if possible, keeping or advancing in some sort of job where your needs are met are in a word, work. Then of course comes paying rent or mortgage, banking, insurance, on and on it goes. With marriage you will rightly share responsibility but then come negotiations and sometimes arguments over who does what when, how much for this, can we afford (no) that, etc., etc.. Kids magnify all this. Taking a second job, even part-time or on weekends to suppliment income may be part of the situation. All of this adds to the weight of responsibility. Please know, there IS joy in relationships and work, but there is also effort and expense. There is emotional, physical and time investment. And sadly, there are failings, breakups, job loss, sickness and even natural disasters of which we did not foresee. Complications. If you add this or that hobby (good when in moderation which many of us struggle with…), mix in unexpected trauma of illness, maybe family issues of some sort, perhaps an addiction or two -it’s not all that difficult to understand how things can spiral out of control. So many more details to navigate than when you were younger and pretty carefree. When I see the FaceBook “it’s complicated” quotes I usually laugh -because most all relationships get that way over time. Certainly the three, four and five dimensional life as I describe it above all serves to put a concept like “simplicity” on a back burner. Speaking of which- did you remember to turn coffeepot and stove off before you left for work?? Some complexity and accompanying burden has to do with our desire, some with the wants or needs or at least perceived needs others have that in some way involve us. And you see I now shift from “you” to “us”. What I’ve described is what Val Kilmer playing Doc Holliday in “Tombstone” simply called “Life”. “It’s just life Wyatt”. I would only beg to differ in the sense that life with my Risen Savior makes it better if not easier. In fact I’d say a genuine Christ follower (as Tozer wrote) “will always have the wind in his/her face”. In no way do I mean that in terms of politics or the like. I simply mean we don’t only “live for today” or “for here and now” on earth as we believe in a literal heaven, a genuine, personal God Who loves us and regardless of the burdens in “this veil of tears”, the complexities and struggles, pain and injustices of this mortal existence, it ain’t even CLOSE to the “end” when we die. This is partly why un (or “pre”) believers think we’re crazy to believe and follow a God we’ve never -seen-, care about biblical words like “obey” and “obedience”, sometimes talk about surrender and “dying to self” and even in some cases end up suffering martyrdom. One doesn’t get up on a given morning and decide to complicate their life! Neither myself nor anyone reading this plans on enjoying a battle with cancer, or a car crash, having to hear what may be quite shocking news about one’s loved one or a friend who after 30 years left their spouse or committed suicide, etc.. Yes, life gets complicated and likely moreso as one ages. We learn we aren’t “bullet proof”, that our energy isn’t unlimited, that we cannot eat nor play in quite the way we did when we were young or we pay a negative price. I write all this in a backdrop of a good friend phoning me today who is dealing with heavy family trouble, another friend battling life-long addictions, an older bro. who just spent his first Thanksgiving, Christmas, New Years and his wife’s birthday for the first time without her as she died last year. This morning at church I hugged another good friend who dealt with the same loss. Another friend emailed myself and others asking for prayer for his dear Mother who may well pass soon. So the realities of life can indeed be tough, disheartening and crowd plenty of details into your mind, emotions and even nightly dreams. This is where short and even longer breaks, retreats or date nights are helpful. We cannot always slow down or keep it simple, but it’s a gift when we pray, stop and consider how to organize and as possible, do so, regardless of age, issues or time. Slice of life stuff to think about! So… did I or anyone I knew or know change for the better, move away and even fully out of the misery of addiction? What I cannot attribute it to is human will power, human intelligence, this or that group therapy practice ALONE. All of these tools helped and help but relationship and surrender to God are -THE- deal along with these other helps in the road to recovery. This is my personal experience of recovery over four plus decades. Nobody “white knuckles” their way to a fully changed life regarding actual addiction. It’s also important to understand the term itself has to do with an inability to free one’s self by one’s self. The repetitive, mostly unrelenting urge to yield to the given addiction over and over is what addiction at core, is about. Temptations never fully leave. They may ebb and flow like any tide, but must be dealt with as long as we live on this earth. Discovering and sanely dealing with “triggers” that move one to “self-medicate” and dealing honestly with those root causes and stimulants to whatever addictive stimulant, depressant or other sort of destructive behavior and acting out -this is what I’m talking about when using the word “addiction”. As I mentioned in my earlier post, there are lots of therapies that do help, that give one a “handle” on our downward, spiraling habit patterns but in the end, I found in Jesus Christ my Higher Power and recognized that until and unless I sought Him out in a daily, actual conversation including application of His Word (in fact, the whole of The Bible) that I could not “walk in the light” and continue to escape the darkness that had such powerful control over me. I think it’s no reach, and safe to assume that John ministered to various addicts over his years of ministry. It’s also safe to say the western world is fully loaded with addicts of various kinds. In only a very brief unpacking of these two verses, let me explain key parts of my own sobriety by the grace of God. “IF”- personal choices, small, large, consistent decisions that line up with what Jesus says, did and does. We need a Savior from sin, ourselves, our temptations and from eternal separation. A massive word, “if”. “WE WALK”- not merely thought, prayer, emotional commitment and wishing… practical STEPS, walking, movement away from X and towards God, others and loving ourselves rightly as opposed to everything BUT walking our sobriety out. “IN THE LIGHT”- an actual, living, conversational relationship with God and in brutal honesty, with the people of God daily, moment by moment regardless of the cost and obvious pain involved with a perfect God and truly imperfect people. The “light” of the Gospel of Christ as well as open, honest living before people. This is what He did, this is what we must -do-. God-conscious choosing, living. “WE HAVE FELLOWSHIP WITH ONE ANOTHER”- only THEN as we walk in the light do we have genuine fellowship, even of a spiritual nature- with others as opposed to wearing masks and duplicity, deception to cover our addictions. “THE BLOOD OF JESUS CLEANSES US FROM ALL SIN”. I fully realize that this is often the deal-breaker for many addicts. I can only say that if you fully study what in Christian theology is called “the atonement” you will only then begin to understand what this verse and in fact my Lord and Savior is all about. Love overcomes. Addiction destroys. Humans in all our ability and power are not God. We cannot redeem ourselves, period. Our repentance and God’s forgiveness extended to each one of us are not optional matters. Until and unless we are willing to face the first, the second is as out of reach as is our sobriety. FAITH, IF, CONTINUING, WHAT JESUS SAYS IN THE FOUR GOSPELS STUDIED AND APPLIED, GENUINE ACTION IN LISTENING AND LEARNING, all after which we are on the journey and path of KNOWING WHAT JESUS CALLS “TRUTH”, and the result, FREEDOM in all areas of life. Yet it’s all about HIS Word, what HE identifies as Truth, and what HE defines as Freedom. At such a crossroads, some (as the old song goes) fall down on their knees while others blow right by, on to the next ditch. I fully get that some will never agree with many points I raise here, but as I said, this is my personal experience and in fact, what I consider reality far exceeding nay-sayers. God offers grace! Will you choose serving Him and others or a “life” in the service of your addictions? In my much younger days I thought it might actually be possible for me to change folks. Change myself even. Don’t freak out upon reading these first sentences, please stay with me for a moment! Like so many new Christians I pretty well thought a genuine prayer and confession of faith in Jesus Christ would begin, seal and end my journey of need. I mean, I understood nobody would be perfect or sinless after praying such a prayer, but along with God’s forgiveness it seemed miracles were constant, continual and “it’s all in God’s hands so that’s that”. Like many, I figured there might be some sort of spiritual formula, a fail-safe way of “fixing” this or that part of human sin nature to the extent temptations would fairly disappear. I mean, I knew they wouldn’t but hoped for such a conclusion. Plenty of people ask me for help and I try to do what I can, but I also have learned there are no absolutely successful ways for anyone to change to the positive unless they are personally ready and committed to change. Love is not about formulas, it’s about relationships. Relationships with God (THE real, true, perfect One) and people (sometimes phony, on occasion liars, all sinners and capable of deep ignorance) are BOTH messy. Messy re. people because we are. Messy with God due to -us-, not Him!! If one is not prepared to take whatever steps are essential to one’s deliverance, to take the hard choices and walk the often uphill journey to healing, change and spiritual growth, it will never happen. No amount of anything or anyone will “fix” it. A personal epiphany and surrender to God and His truth (what HE thinks, says and does, His commands as well as His promises) is the beginning of freedom. Until and unless that, recovery, a new life, a truly changed person (in the best sense) isn’t going to happen. There’s a massive difference between discovery of an alphabet vs. writing a masterpiece novel. The fist step of a marathon isn’t the victorious finish line. We DO have to start somewhere -but you get my point. This little thing called “free will”, the biblical concept of “Today, choose who you will serve”, the individual and corporate ability to make choices never ends as long as we have breath and walk the earth. Because it’s difficult, a journey filled with thorns, side-trails, a thousand obstacles, crosses, people who think you’re crazy to even try, or care, or that you REALLY should live in the same sin they do… well you understand it’s a road less traveled and in some senses, for good reason. There came a day I realized nobody could help me in any real sense until I surrendered to Jesus and truly handed Him the keys, the entirety of my life best I understood what that meant at the time. That was the beginning of my (thank GOD for GRACE!) sobriety. He has been (Psalms) “my sustainer” and in that He never changes, I am changed in the process of this continuing relational journey. There are many tools, scripture, prayer, accountability partners, mentors, books, Twelve Step and more help that indeed work- but it’s about moment-by-moment willingness to walk the walk. One can technically memorize and even know all this… like being married but constantly running after someone other than your spouse. Being clean and sober isn’t a mystery as much as a walk, a surrender and a “turning our lives over to the care of God”. He truly cares. Do you or I? How much? That, my friends, is the cross and indeed, prelude to resurrection… in a genuine sobriety. 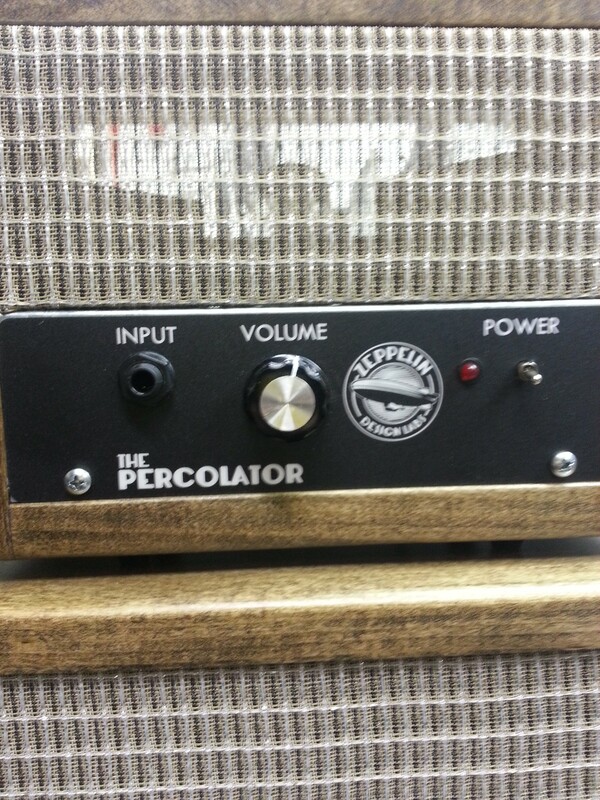 My musician/techie tone-meister friends at Zeppelin Design Labs here in Chicago have brewed up The Percolater. This little baby is the coolest 2-3 watt boutique amp ever. I’ve played both guitar and harmonica (via diff. mics) through it at low and cranked volume and one of these will be in my arsenal of music tools for live shows and recording work soon as I can get it going. HOW shall I “get it going”? 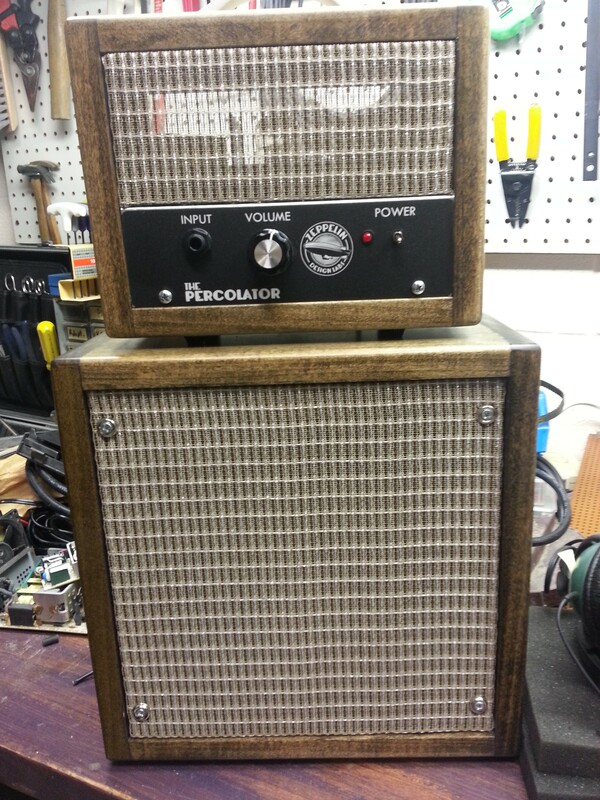 It’s a tube amp kit and they’ve asked several peeps to consult with them. I am going to build one this winter and log the experience for them (and yep, myself I admit). After playing through the prototype a couple times I couldn’t be more impressed. So I’ll let you know more as progress happens. My schedule is getting a bit full so I must keep focus. If you know me you know I LOVE coffee… and sweet little crankin’ amps for blues and blues/rock. Looking forward. Brutal honesty. A painstaking (yes) consideration of each element in/of song as it’s being constructed. A hard, honest admission of one’s own priorities and what it is the draws you to the artist/s who inspired that style, sound, riff, chord progression, effects, bass line, etc., etc.. Is THIS song anywhere near as strong as the song/s that inspired it? In its present state, how does your song stand up next to theirs? Why or why not? WHAT drew you to RE-listen to that artist’s song over and over again? What elements do you expect will call listeners back to your song? Will anybody care about this song in 30 years time? Why or why not? To be fully blunt: unless you care about quality songwriting, don’t bother reading any further as you may be challenged in your artistic maturity. Please know I’m not writing this to discourage anybody from composing songs or recording tunes as a hobby. I’m indeed trying to share my own thinking process about how to aim and actually hit the target: a truly well-written song. There are thousands of books in the library nobody reads. Do you really think being an author is your calling? With the internet and digital recording, free placement and offerings plus publicity online we have millions of songs uploaded and available to the public. Why should anyone care about your song/s?? Before I go further, in my own estimation I’ve written only a couple handfuls of truly brilliant songs. As I write, I’m 61 and wrote my first song at 13, have recorded nearly 40 full-length records and a lot of other songs, collaborated with other artists in songwriting, arranging and co-production. I have written a number of genuine clunkers including recorded and released songs, and plenty of trite, forgettable tunes, certainly parts of songs, this or that vocal, guitar part, whatever. Yes, I have taken my own advice for many years and still by technical fact or merely personal taste, gone ahead and played a song in concert or recorded it for public consumption even with its/my flaws. Don’t get me wrong, I am no Bach, surely no B.B. King nor Hendrix in the blues or rock vein and I know it!! But HOW might we write better songs? So many rely on their own passion for a song or the actual part they play or sing to judge whether a song is a good one. That’s a novice mistake. You may be a brilliant musician but a horrid songwriter… or lousy arranger of the song’s parts. A good, brutally honest, gifted songwriter or producer -may- be of help in song selection and writing for you to grow as a writer. have benefitted from all sorts of input from close friends who are/were musicians and even non-musicians who critiqued my music, lyrics, arrangements and final mix in recording. We argued over ideas until arriving at what seemed best for the given song. We often took a fair bit of time getting there. Impatience is a major issue in great songwriting and recording. Plenty of musicians have very little of one so not much of the other. Everything from lyrics, basic melody, rhythm section (drums, bass, basic guitar and/or keyboard) parts, actual vocal phrasing, pitch (especially considering the singer/s) and tempo are all elements of songwriting that one can and ought to consider as they are options that together make and break a song. If the average person (or at least average person who loves the style it’s done in) hears your song once… ONE TIME… was anything about it (basic melody, lyric) MEMORABLE ENOUGH FOR THEM TO HUM OR SING as they walk away? How easy is it for them to forget? Is there a melodic “hook”, a key phrase that’s repeated enough, unique enough? Is there a melody, basic riff vocally or via guitar or whatever instrument, even a chord structure that makes it fetching and memorable enough that it will move a person to want to hear that song again- or at least remember it even if they WANT to forget it? Is your main “riff” a winner, perhaps even simple yet truly hypnotic… or so repetitive it’s a flaming bore? All this is hard to know without careful analysis. This is where recording, even on a smartphone or some sort of cheap recording option (netbook, whatever) and listening back to the demo of the song, even taking several days or a week -away- from the song, then listening to it fresh and considering can help you and others decide if it’s worth putting out in public or not. Perhaps a more thorough re-write or arrangement or whatever will move the song from the dustbin to the playlist? IF the song is not memorable (regardless of style), you’ve got a “filler”, a “grade D” song no matter how much YOU may love it or love the part/s YOU play on it. Is it about you or the song? What about the audience? Is it about quality of artistry or merely career choice? The work of quality song construction, editing, recording and placement may mean it’s remembered in 50 years or entirely worthy of being forgotten. One reason much art might be deemed mediocre is that the artist in question wasn’t willing to get gut-honest with the details of analysis in songwriting and production. Great songs are more important than technical talent, passion in performance or amazing tones in recorded production. Read that sentence again. Feel free to argue this point but in the end, it’s the song over everything else. This is why you must not allow your own sense of honesty to fail in assessing a song’s strengths, weaknesses and possible need for re-editing before you release it in recording or live shows. There are certainly times “the muse” hits and we create an amazing, decades-spanning song with little effort… but those moments are rare. I write all this to encourage the effort, the hard work great songs usually require, not to discourage anyone! We all try and fail, that’s normal in creativity. But we must not allow “work allergies” to hold us captive to any real talent we may truly have. Stewardship of our God-given gifts is a major part of life. So if you read my last blog here (on building a little slide guitar) you know I on rare occasion joke about being “addicted”- to God, coffee, simple slide guitar making, hot sauce, etc.. But I don’t joke about it often. Because I lived it in my pre-faith days. In a word, for me it was Agony and the closest thing to hell I’ve ever experienced. Yesterday a Finnish friend wrote a Facebook post about his past alcoholism and freedom he found, sobriety over many years as the result of faith and surrender to Jesus. He made the statement that nobody ever had to apologize for not wrecking their marriage, family, not crashing cars, etc., due to -not- drinking. Clean and sober is a gift I deeply appreciate. In the past couple of years I’ve talked with folks near and far about the essential services of recovery work re. the sad, sick and sometimes fatal addiction issues we see in ministry. I have recognized it in jail and prison visits, in our local shelter work, on and on it goes. Just the day before the FB post I mentioned here, I saw a front-page article in a local paper (that I normally think is only worth reading about 4 times per year). Note, neither you nor I are likely to fully agree with each point raised or emailed in by readers, but it will be interesting to all who love and care about ourselves, loved ones and the many “costs”. I’ve been talking and writing about addiction for years as it’s such a funnel-down core issue for so many people world-wide. My email runneth over. Run a search in my blog and you’ll find plenty, also in a podcast or two. The Bible term for “addiction” might arguably be “idolatry”, the fruit of the Spirit most needed to combat such- “self control” (see Galatians 5.23 in context) but in any case I think the majority of our nation would benefit but facing up to it.